Berlin Warschauer Strasse is one of the best attractions in the city of Berlin. 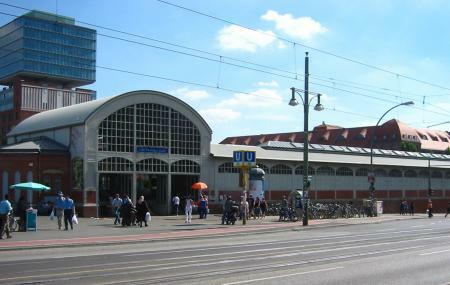 It is a station which is a part of the Friedrichshain area. It is named after the city of Warsaw, the capital of Poland. The Prenzlauer Berg is also accompanying this station and is great place to see. It has a major historical aspect to it as it has been working ever since the 1930s. Today, both S Bahn and U Bahn connect from this place. It is a double deck bridge sort of a station but because of its historical importance, is definitely one of the best city stations and attractions to see. Nearby tram stop: Revaler Str. and S Warschauer Str. How popular is Warschauer Strasse? People normally club together Volkspark Friedrichshain and Turkish Market while planning their visit to Warschauer Strasse. Good station with a lot of changes. For some people that could seemed like criminal street and station but you have to just walk around and feel atmosphere. It’s really great to be here and feel another not touristic side of Berlin. Warschauer Straße is a big station situated in the lovely walks of Berlin.The Station has a major connection with U-3 and U-1 line which further connects with S3, S5, S7, S75 and S9.This station is now becoming a major tourist attraction because of the river spree in the Friedrichshain neighborhood of Berlin, Germany.The two train stations as well as the street tram that terminates adjacent to the U-Bahn station together accommodate over 85,000 passengers daily. Some of the other reviews on here imply that this is some sort of death trap where you'll get mugged and or stabbed. Certainly not the nicest place at night but so long as you don't dress and act like a stupid tourist you'll be fine. This is no more dangerous a station than anywhere in one of the slightly rougher areas of any major city. Just don't be an idiot and you'll be fine. U bahn and s bahn connection is awful though.